A new landmark has been added in the metropolis of Mumbai. 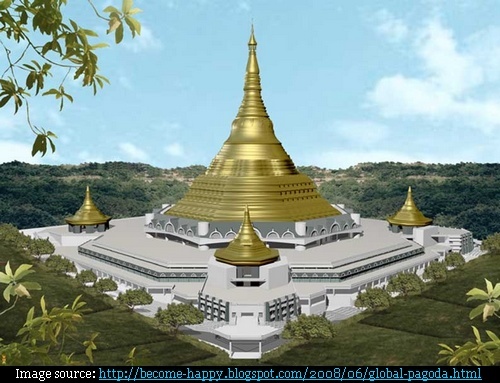 It is Global Pagoda also known as Global Vipassana (meaning Buddhist meditation) Pagoda - the largest stone dome in the world built without supporting pillars. It was inaugurated by President of India on 8th February. Although it has started functioning but the decorative/finishing work is still in progress. Once finished it will look like this model. Located amidst the mangroves at Gorai on the outskirts of Mumbai, the 96 metres high Pagoda is modelled on the lines of the Shwe Dagon Pagoda - in Yangon, Burma. The dome which is actually a large meditation hall has a diameter of 85 metres and can seat at least 8,000 persons. It is made entirely of stone and limewater without any steel or cement. It has been claimed that such a structure will last for at least a 1000 years. 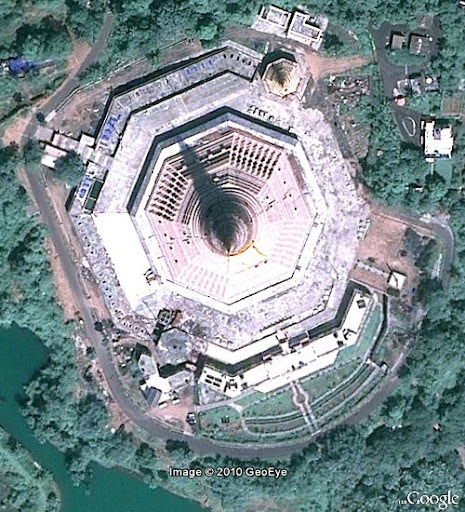 This building is particularly impressive from the air. I caught a glimpse of it during a helicopter flight between Mumbai and Tarapur. The scale of the building and the setting on the coast are incredible.